We specialise in parental child abduction recovery services, with over 85% mission recovery success rate. Our aim is to give parents an understanding of how they can prevent child abduction before it happens and what steps they would need to take to negate the abduction all together. More than 203,000 children are abducted by their parent during the school holiday periods each year and its only increasing? If your child has only just been abducted the first 48 hrs are absolutely the most crucial time in any parental child abduction or kidnapping. 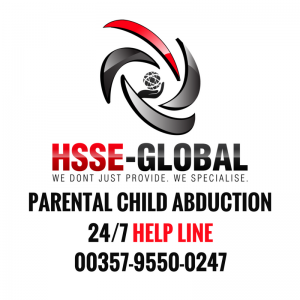 Hsse-Global parental child abduction recovery services branch understands the emotional stress, anxiety and turmoil that accompanies the parental abduction of your child. Your child has been abducted and waiting around for Government agencies to apply through the legal process can take weeks, sometimes months before Government action can be taken. In the meantime as you wait for decisions to be authorised and acted upon you are living in your worst nightmare. Following multiple phone calls with multiple agencies, you will have still not resolved the solution of getting your child back, immediate action needs to be taken, which will reunite you with your abducted child. The reason for this delay is that the government authorities have legislation with standard operating procedures and guidelines which they must comply with. Authorisation from government agencies can take up to a month or longer just to get approval from the courts to involve the authorities and still longer to get the main stream media to assist in the search for your abducted child. No parent would want to wait a month let alone a day before any positive action could be taken. Our parental child abduction recovery services teach you to recognise what signs to look out for enabling you to implement the necessary process in time, to prevent it from happening or you can call us now for your free consultation. 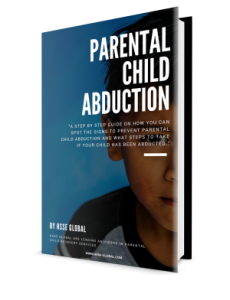 In our free parental child abduction recovery service eBook, we discuss what signs to look out for and what you can do should you be suspicious of possible parental child abduction. Preventative Measures – Pre-indicators that would raise flags that your child maybe abducted, and how to spot those signs. Immediate Actions to Take – If your child is abducted, we cover the necessary steps to take. The Different Stages of Abduction – Steps and Actions to take should their child already have been abducted. Our parental child abduction recovery services branch aims to raise awareness for parents suffering parental child abduction, through providing certain characteristics and behaviour signs to look out for. Our primary aim is to give parents an understanding of how they can prevent child abduction before it happens and what steps they would need to take to negate the abduction all together. We will do what we do best and develop an immediate plan of action and strategy to recover your abducted child. Download your free ebook by clicking here now.